Ah-MAY-zing Reads 2014 started out as a sudden, out-of-nowhere idea. 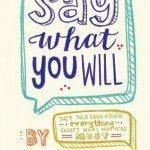 I was very excited about several upcoming book releases for Spring and wanting to share that excitement with you guys, I got to thinking (more like dreaming) about just how marvelous it’d be to have the authors of these upcoming books on the blog. With that idea in mind, I got to planning this whole event. And now, I can’t believe it’s happening! Basically, starting tomorrow, and throughout the weekdays of May, Stay Bookish will be taken over by several fabulous authors and we’ll be having a series of fun interviews, cool story soundtracks and interesting guest posts regarding their awesome Spring 2014 releases. 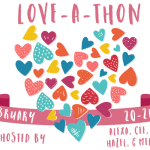 There will be so many chances to win books and cool prizes for the duration of the event so I encourage you to watch out for every Ah-MAY-zing Reads post! 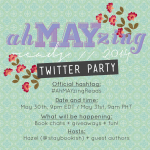 Aside from all that, I will also be having a twitter (chat) party #AhMAYzingReads on the 30th of May, 9pm EDT! We’ll be talking books, books, books, and you guessed it- books! We’ll also have several ah-may-zing authors participating with us so it’s going to be capital F-U-N! Again, there will be chances to win awesome stuff then! So save the date! 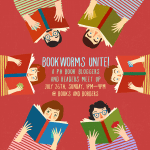 This will be Stay Bookish’s first ever blog event so I’m just completely psyched. Seriously, utterly, ah-may-zingly psyched. I hope y’all are looking forward to this too! Your support will be extremely appreciated! Can you guys guess which authors will be participating? Oh, and which Spring 2014 releases are you excited for? Thank you! You know it. ;) Hooray for contemporary books! Sounds like a great adventure to the blog! This is such a great idea Hazel! I’ll so totally be keeping my eyes open for stuff on the blog! I’m exited for Sweet Reckoning this month (for the UK) so that’s my most excitedly waiting for read! This is such a wonderful idea! 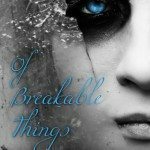 I’ve definitely been noticing some really great YA books coming out this month so this event sounds awesome! It’ll give me something to look forward to in a month filled with studying for exams, bleh. Ahh, how fun! Great event idea, Hazel! !